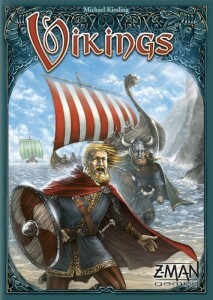 We review the newest edition of Vikings from Z-Man Games. This new reprint brings back a tile-laying eurogame where players must build out their viking island chain. With some unique game mechanics and fun play, Vikings is a must play. Draw a tile and place it on the table…place a wooden figure or “meeple” on the tile…score and repeat. Does this sound familiar? 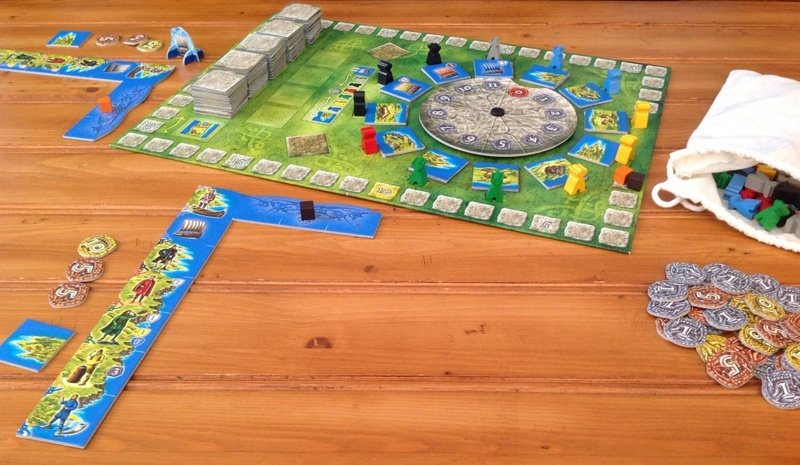 If you’re a fan of Carcassonne or other Carcassonne-like games, it should. However, in this review we are not building roads, cities, farms, and cloisters in the French countryside. Today, our meeples wear pointy helmets and can take on one of six roles, depending on their color. The tiles we draw only have two features on them: water and islands. This is the world of Vikings, a game originally released by Hans im Glück (and distributed in the US by Rio Grande Games) in 2007. It has long been out of print and has been very hard to find in recent years. However, it is scheduled to be reprinted and re-released in May 2014 by Z-Man Games, so I thought this would be a good opportunity to revisit one of my favorite games, explain the game play and give some of my thoughts on it. Read on! 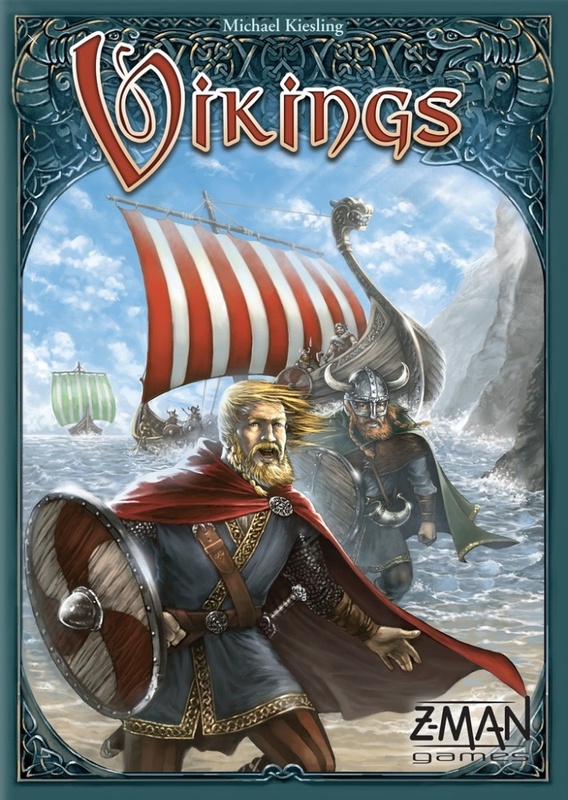 Vikings is a tile placement and auction/bidding strategy game by Michael Kiesling, for 2 to 4 players ages 10 and up, and plays in about 60 minutes. Vikings plays best with 2-3 players. 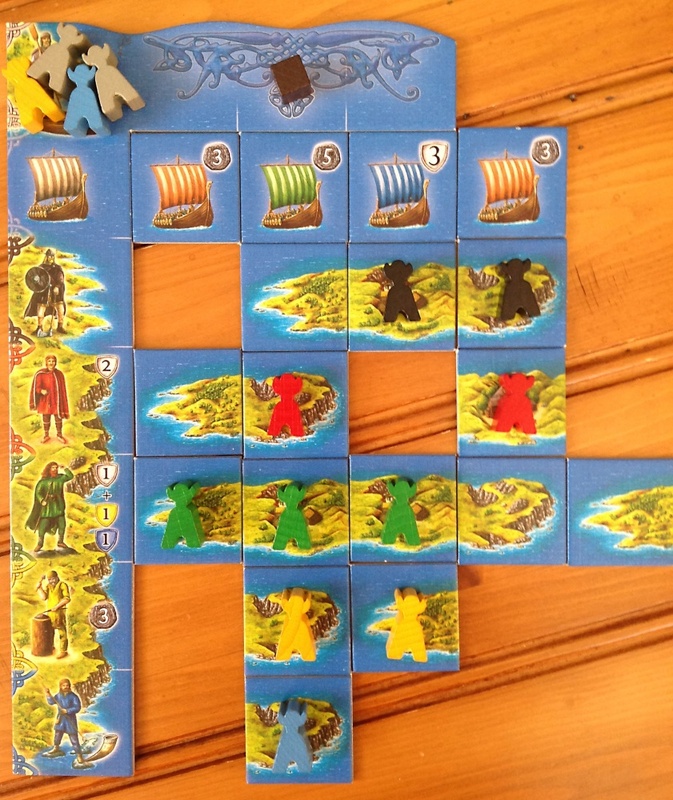 In Vikings, the players will be acquiring groups of Viking meeples (along with land tiles) and settling them as craftsmen, nobles, and other occupations on the islands near their homeland. Attacking ships may threaten the new landscape, but if Viking warriors are positioned in the correct places they will provide protection and also earn victory points and/or gold. Each type of Viking can earn victory points and gold in various ways. After six rounds, the most successful Viking leader wins the game. Vikings comes with a solid group of components, including a rotating wheel in the center of the game board. Each player starts with an L-shaped cardboard base representing his homeland. The vertical side of the homeland base depicts rows of Viking settlers in different colors. 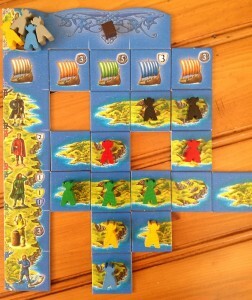 These correspond to the six colors of the wooden Viking meeples and represent different occupations: fishermen (blue), goldsmiths (yellow), scouts (green), nobles (red), warriors (black), and boatsmen (gray). The Vikings are all placed into a draw bag during the game. 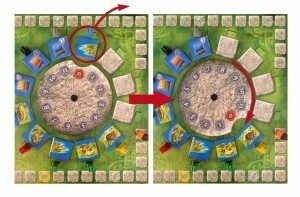 The central game board consists of a large rotating wheel with 12 spaces where landscape tiles and Vikings will be placed for purchasing. It also contains an area for stacks of the landscape tiles as well as a victory point track. The tiles contain a variety of configurations, showing either an island segment (left side, middle section or right side) or an attacking ship. Each player also starts with a starting land tile, a certain amount of coin tokens depending on the number of players, two player markers (to denote their player color and for use on the victory point track,) and a scoring summary card. There is also a start player marker to keep track of the first player for each round. The land tiles are shuffled and placed face down in six stacks on the game board. The tiles from the first stack are turned up, one at a time, and placed in the designated spaces around the wheel on the game board. 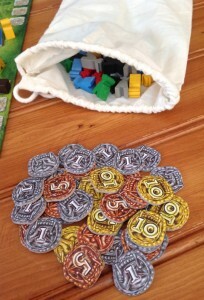 Next, 12 Vikings are drawn from the bag, sorted by color, and placed around the wheel in a specific color order (as shown on the game board), so that each space contains 1 tile and 1 Viking. 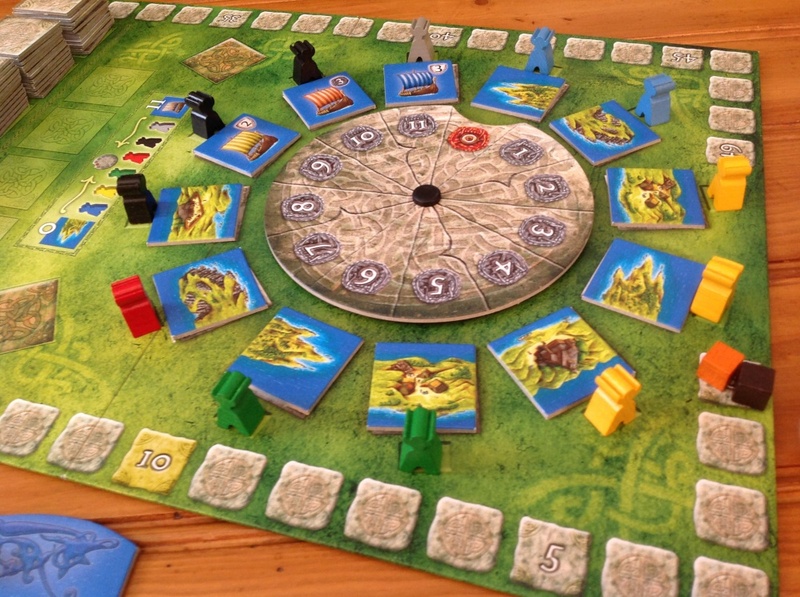 Each player take turns acquiring Vikings and tiles, one set (a tile and its corresponding Viking) at a time, by paying the cost in coins shown next to the set on the wheel. The set on the “0” space can only be taken for free if there are no other Vikings of that same color on the wheel. If a set is taken from the “0” space, the wheel is rotated clockwise until the “0” reaches the first set still on the wheel. This effectively reduces the price of all remaining tiles and Vikings. Once the last tile is taken from the zero space, the wheel will rotate clockwise, making all other tiles cheaper. 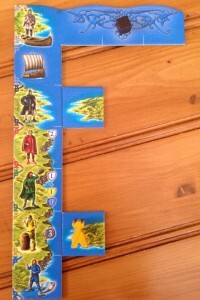 Once acquiring a set, the player adds both the tile and the Viking to his homeland base. A land tile may be placed in any row, water edge next to water edge and land edge next to land edge, and following the orientation of the island segments correctly (left —> middle[s] —> right). A ship tile can only be placed in the first (top) row. If a player places a tile in the row that matches the color of the Viking acquired with the tile, the Viking can immediately be placed on the tile. (For example, a green scout Viking can be placed on a tile that was just placed in the green scout row.) If the row color where the tile was placed does not match the Viking’s color, the Viking is placed in the upper left corner of the homeland base tile, near the gray boatsman graphic. Only one Viking may be placed on a tile, and once placed, Vikings cannot be moved throughout the game. As tiles and Vikings are being placed, players need to be mindful of the following situation: a ship (placed in the top row) is said to be “threatening” any Vikings placed further down in that same column. The threat extends down to (and including) the row that matches the ship’s color. Threatened Vikings will not score. However, a threatening ship is considered to be “repelled” if a black warrior Viking exists on the tile directly below the ship. Thus, the warrior is protecting the Vikings in the column, and they are able to score. Players will building out their island chains during the game, hopefully with Vikings that will score them victory points. When all 12 sets of tiles/Vikings are purchased from the wheel, the round ends with a scoring phase. At the end of rounds 1, 3, and 5, this is a “small” scoring, and after rounds 2, 4, and 6, a “large” scoring occurs. Before scoring, if a player has any gray boatsman Vikings on their base, each boatsman is able to move either all Vikings of one color, or 1 Viking of each available color, from the base to any appropriate empty land tiles. (The gray boatsman Viking used for this purpose is discarded from the game; it serves no further function.) Next, players have to consider whether each column’s Vikings are threatened by a ship (and will not score), or are protected from the ship by a warrior. Black warriors earn either the coin value or victory points depicted on the ship (above it) that it is repelling. Each red noble on a tile earns 2 victory points. Each green scout on a tile earns 1 victory point, as well as 1 additional victory point for each yellow goldsmith and blue fisherman on tiles directly below the scout. Yellow goldsmiths also earn 3 coins each (as in a small scoring). The blue fisherman is only considered for their own scoring during the end-of-game scoring phase. When a scoring is completed, the wheel is filled for the next round, placing the tiles from the next stack and drawing 12 new Vikings from the bag, as done previously. All tiles and Vikings in a player’s area remain in place (and can score again in future scoring phases). The start player marker is passed to the next player in clockwise order, and a new round begins. After the 6th round (and its large scoring phase) is completed, a final scoring takes place. The winner is the player with the most victory points. The wheel in the main board is the best part of the game. Not only does it provide for a strategic tile collection mechanic, it also makes for some hard decisions during the game. Let’s get this out of the way right off the bat: I really enjoy Vikings. It’s easy to teach, and for a game using only a few simple mechanics (purchase tiles and Vikings, and place them in your homeland area) there is a surprising amount of strategy that needs to be employed. I especially like the way that the purchasing wheel works. You’ve really got to weigh your choices carefully. Deciding whether or not to take the free set at the “0” space (if it is available on your turn) forms one of the most strategic elements of the game; if you take the “0” set, you will cause the rest of the sets to now be cheaper for the other players to purchase. Do you really want to do this? On the flip side of that, are you sure that you want to purchase the set that frees up the “0” set for the next player? There are many different paths to victory in Vikings. One of our players tried to have as few coins as possible so as to collect as many free tiles as he could. I haven’t yet mentioned that the game also comes with a “Progress” (or “Advanced”) version. One element of this variant consists of revising the tile and Viking placement phase by adding an auction, where players bid for the right to be the one who places the sets on the wheel (with some choices not offered by the base game rules). There are also a set of “special” tiles which are added in the variant. These are not placed in the same area as the island and ship tiles, but instead, they offer some additional scoring opportunities, both in-game and at the end of the game. I think these variant components and rules really are a great addition to the game, and once players are comfortable using the base game rules, I see no reason not to play the advanced version all the time. During scoring phases, Vikings need to be protected by the black warriors or else they won’t score when threatened by a ship. Something else that I like about Vikings is how fast it moves. One would think that with so many agonizing (at times) decisions to be made, that players would be prone to “analysis paralysis”. However, this is not the case; I’ve always experienced very little down time in between my turns. I’ve played Vikings with each listed number of players (2, 3, and 4), and I think it works best with 2 or 3. With 4 players, there’s just a little too much competition to get the limited tile/Viking sets for the right price at the right time. In the rounds where a player is last in turn order, they may feel like they are fighting a losing battle in regards to tile/Viking choices. It can be pretty maddening to have your eye on a particular set that you need, only to have it snatched away right before your turn by the player to your right. I probably wouldn’t go out of my way to play this game with 4 players. Aside from the difficulties I feel exist with 4 players, I still consider this to be an excellent game. For me, Vikings hits that sweet spot between looking deceptively simple, and requiring a good amount of strategy. As mentioned above, the game comes with additional tiles that can be added to play the advanced version, and in my opinion, the advanced option only adds to the replay value of an already fantastic game. Vikings should be readily available again in its reprinted edition and is absolutely worth checking out. This new version is good news for anyone who has been eagerly waiting to add this game to their collection. Final Score: 4.5 Stars – A fun tile-placement game that features a unique pricing wheel system, and offers no shortage of strategic choices to the players on every turn. • 4 player game can be frustration for some. • Minor nitpick: The game could probably use a larger supply of 1-value coins. It seemed like we were constantly running out of them and having to trade them in for higher value coins.